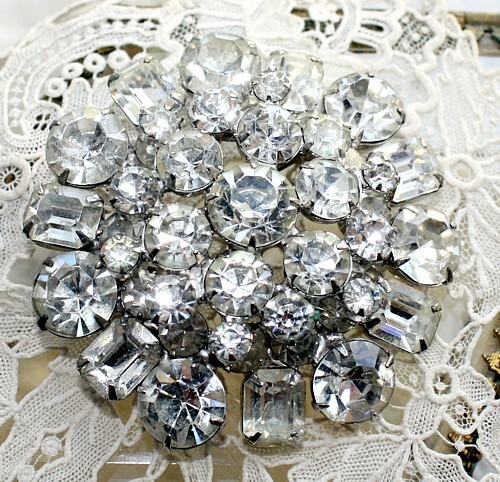 Absolutely breathtaking Vintage Round Domed Rhinestone Brooch, with different sized prong set glittering beauties, what makes this pin particulary stunning is that there is a second "dome" of round Rhinestones giving this piece a great layered quality. From a collector's estate, this is truly a gorgeous pin, a joy to wear and very collectible. Rhodium plated on the back, I couldn't find the signature, but pieces like this were made by DeLizza, and Weiss in the early to mid 1900's. Sure to become your "go to" piece for daytime with jeans, and night time with your most elegant dress. Or give it to a best friend for a fabulous gift, if you can bear to part with it once it arrives chez vous. Don't miss this one!